While we’re still playing with some of the Spiel des Jahres 2016 candidates, maybe now is a good time to look at a past nominee. One of the three SdJ nominees last year was simply called The Game, a card game created by Steffen Benndorf and published by Nürnberger-Spielkarten-Verlag. The Title doesn’t give anything away, until you read The Rules the game remains a complete mystery. Of course it could have been called The Cooperative Card Sorting Game, but that wouldn’t have left much space on The Small Box. It would have been accurate, though, sorting cards is exactly what The Players have to do. 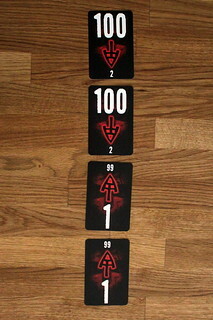 The Deck contains 98 cards with the numbers from 2 to 99. If The Players can sort them they have The Victory. Obviously, that’s not going to be as easy as spreading out the cards and piling them up in the right order. All The Cards have to end up on one of four piles. Two of them start at 100 and may only ever move downwards, so once you played a 50 on them only cards with a smaller value may go on top, and once you have a one that pile is done. The two other piles start at 1 and work exactly the other way around. Even that would be doable if The Players had all The Cards in The Hand at once. But they don’t. Depending on the number of players, each player holds from five to seven cards and on their turn they must play at least two cards to any pile or piles before they draw back to their full hand size. They keep going around until all cards are in one of the four piles. And suddenly it doesn’t sound so easy any more. Actually, playing The Game like that it would be pretty much impossible to achieve The Victory. We tried. But there is one way to move piles in the opposite direction. A card that is exactly 10 above than the current top card on a descending pile, or 10 below on an ascending one, can go to that pile and give you The Breathing Space. With proper team coordination, you will manage The Tenner Step at least a few times every game, and then you have a chance to achieve The Victory. Like most cooperative games, key to The Game is proper coordination and communication. But unfortunately, it didn’t solve the problem of problem of restricting communication. The rules say you may talk about your cards, but not mention exact values. That didn’t work well in Shadows over Camelot, where the five card values were commonly known as “a little help”, “some help”, and so on (note that no value is ever mentioned) and it doesn’t work in The Game either. All it does is force you to say things like “I have a card that is very, very close to that card, but not the closest it could be, should I play it or wait”. That just doesn’t work, this kind of partial secrecy doesn’t add anything useful to a cooperative game. That’s not quite the only problem The Game has. Some might consider that it’s a very light, abstract game about sorting numbers problematic, but really, that’s not a problem, that’s just the game. You know what you’re getting into, so you really can’t complain afterwards. Of course The Game is at the low end of the complexity scale, and I still think it might be too light for the SdJ nomination, but in its category it’s really a solid game. The other problem that does exist, at least for some players, is The Game‘s staying power. You will not beat it on the first try, but after a couple of tries you’ll probably get there. How much keep playing then depends on what kind of player you are. If you can motivate yourself to extend your winning streak as long as possible, then you’ll keep coming back to The Game for a long time. But if you look for new challenges quickly, then The Game likely only coming of the shelve every couple of months. There are no changing start conditions except the cards you have, once you beat The Game there’s not even a score you try to beat. Oh, who am I kidding, The Game is great in the short term, but long term it will only work if you self-motivate. It’s the sort of game you will love for one summer vacation trip. 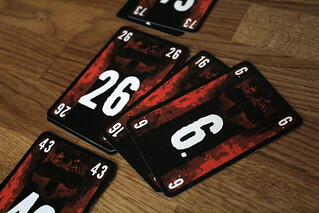 And speaking of new challenges, some editions of The Game include The Expansion called The Game on Fire. It replaces six cards in the game with new, blue cards with flames on them. When those are played, they have to be covered up by the end of the next players turn or The Players immediately suffer The Defeat. The Game on Fire adds a little to a small game, but what I said about The Base Game above remains true: the only long-term motivation is to see how many games in a row you can win.